As the middle child of seven children, Limerick woman Mena Ryan credits her parents for her work ethic and sunny attitude to life. 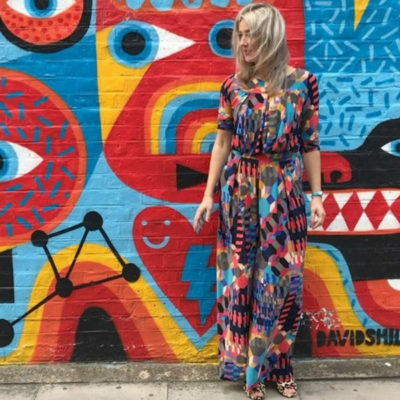 Now a mum of three and living in London – the designer is turning heads with her unapologetic love of prints and bright colours. How did you get into the fashion business? It’s one of those things that happened really organically, I didn’t realise it was what I was going to do when I was in University studying Business and French, but looking back now it seems obvious to me. I’ve always been interested in clothing and especially print and colour. My first job was working on a market stall in the Limerick Milk Market for this lovely lady who sold vintage clothes back when they were called second-hand. I was 11 years old, I saw her one day selling these beautiful pieces, and asked my Mum if she thought that lady would give me a job. My Mum said well go ask and I did! We worked out a system if I sold a good few items I got to choose something for myself, and I loved it, especially seeing how happy women were when they found that treasured item! This followed teen years working in retail, plus an avid love of vintage clothes. After University and a return from London when I was 24, I went on to setup a boutique with two of my sisters; Chica was a boutique all about bringing to Dublin unique pieces from different brands you couldn’t find anywhere else. With a subsequent move to London, and seeing the niche in the market, I set up ONJENU in my 30s in 2010. Working in this industry has been amazing, and it’s been one fun, crazy journey. One thing I’ve learnt is that you are learning every day and I suppose that’s what keeps you going. Onjenu is all about bold prints and vibrant colours. You’re clearly not playing it safe with muted tones. Was that a big risk initially? It was really natural thing for me, print and colour are a huge part of what the brand is about, and its identity is nurtured within the power of colour and print. I wanted to create clothes that are optimistic, but also were modern and timeless. This isn’t about wearing head to toe neon, this is about how print and colour can make you look better; how it can make you feel more confident; how it can work to flatter the figure. I don’t focus on trends, I focus on what women want to wear, what they want to cover, how they want to feel when they wear something. I think about the day to day life, the school runs and work days, when you really want to go home but you have to go to a social work dinner meeting, and you don’t have time to go home to change. Life interests me. I love the fact that women in their 20s love the brand just as much as women in their 70s. Style for me isn’t about age, it’s about what you are drawn to. Where do you get your love of colour and print? Well I never thought about it much before, it’s always been there, I was the kid who came to Colours Day at school literally head to toe in colour, it just made me feel happy. Maybe it’s been a child of the Seventies, all those great clothes my mum kept for us in the dress-up box in the attic that she let us cut up and play dress-up in. I’ve always been surrounded by colour at home, my mum is a very creative person, and she has been an natural influence with her love of colour in interiors and gardening. It’s funny how you don’t think about these things until you are asked, and I think it’s a combination of nature and nurture. Your fabrics and cuts are very flattering to all shapes. Is it important to you to be inclusive of sizes? It’s a big core focus of why I started the brand, for me the brand is about women, and well we come in all sizes. If a shape doesn’t look as good in a size 16 as an size uk 8, it doesn’t excite me. 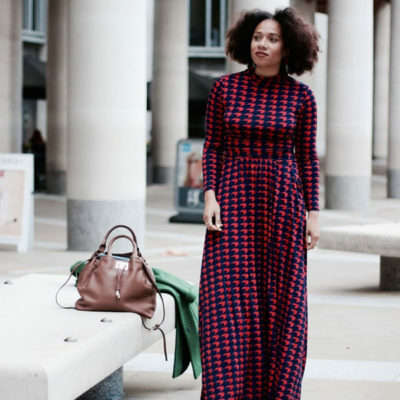 I am so happy when women say to me they never thought they could wear a jumpsuit until they tried our ones; or that top that flatters the arms and the tummy and makes you look and feel modern. ONJENU is all about modern dressing, these are clothes that are size and age inclusive. I’m a big people watcher; I love nothing better than having a cappuccino and sitting in a café and watching women. I’m so happy when my sisters are wearing the brand, my mum and my mum-in-law, my friends, and also that cool hip fashion blogger. I suppose my favourite catwalk is seeing that woman running around Marks & Spencer wearing ONJENU doing the quick grocery shop, she is getting on with life, and she is choosing to wear ONJENU. Or when I spotted a lady dashing for a train at Liverpool Street Station, she was running to catch the train, she wasn’t stopping to fix her dress, she didn’t need to! Oh I can’t choose one. I’m a bit of a mix; Jackie Onasis Kennedy, for those oversized sunglasses and the way she wore a headscarf, Lauren Bacall for her 1950s style and her intelligence, Talitha Getty for her natural glamour in Marrakech of the Sixties and yes Audrey Hepburn for her optimism and that smile. My mum, she has always said to me as a young girl the most important thing you wear is your smile and that always stuck with me. How right she was! Why did you move to London? How to you find living in such a busy city? Do you miss home? I love living in London, it has such a great energy. It’s one of those cities that you think you know, but it surprises you. The great thing about London is that it’s a great big melting pot of different nationalities, it’s a city full of different cultures, nationalities, and you are always speaking to someone from Ireland, there are a lot of us here! Now it’s my adopted home, I met my husband here, had my children here, and started my business here. It doesn’t seem big anymore, and I suppose like anywhere, you create your community. Tell us a bit about your upbringing in Limerick? It was a great one. I’m one of seven children, it was a fun, busy household. There was always something going on when you are from a big family. I loved it! I was really lucky that I’ve got those parents who nurture in you the belief that if you can think it, you can do it. Positive thinking was a major thing in my house, and if you work hard enough, anything is possible, I learnt by example. My parents have always just got on with things, raising seven children, and with us all in different schools, the week was full of non-stop school runs and all the extra curriculur stuff that comes with kids. Hockey, tennis matches, drama classes, piano,violin – we all had different interests. I look back now and think ‘Wow! How did they do it all?’. I know I’m very lucky . My mum is a big believer in education and she really wanted us all to go to university. All seven of us did. Not bad for a house full of dyslexics! If a teacher didn’t believe in us, she always did. My Dad was always a major influence on me, he is a natural entrepreneur, thinks outside the box, and his stories of business along with his positive attitude to problems have always been a major inspiration to me. My parents are the most positive, optimistic, hardworking people I know and you need that when you work for yourself. You need someone who helps you see the positive during those days when you face obstacles, and running a business, there are always obstacles to climb over. To keep doing what we are doing; to challenge ourselves with new projects and to enjoy the ride.